Would you like to be able to allow your customers to buy dripping content, and to set it easy? Well, that's already is possible (and really easy) with WordPress, s2Member® and this plugin. Why this goal can not be achieved with existing tools? s2Member® Pro has a function to drip content, but it is limited to a timestamps established based on the level registration, meaning when a member gains access to Level 1 or Level 2. This brings in limitation since the levels are not independent from each other, and Level 2 members would usually have access to level 1 content too. Each dripping schedule is a sequence of your posts/pages in some special order to be read, actually. OK, let we name that sequence "a playlist" and each post/page in it - "a slide". Your members will read them at the order you set, by the delay time you set. To view next post they will need to wait when next slide will be available. Moreover, they can get a mail to reminder them, that next slide is available. And you (the site owner and/or admin) are not limited to one playlist, you can create as many you need (999 max, to be exact). And you can set a post/page in more than one playlist. This way you can create a video coaching series, a game for your auditory, or exercise set, or can drip a story... or everything else, what needs a time sensitive content dripping. Short description: Creates "drip content" sequences. Longer description: Uses s2M's ccaps, so it is independent from membership levels. Depends only from the purchase time of the exactly playlist. Each slide is a page/post, this gives you several advantages: each slide can contain anything, what usual post/page will take (yes, include "%% tags", see bellow; yes, include 3th party shortcodes; yes, include s2M's conditionals; yes, include video, sliders, galleries, pictures...); one slide can stay in more than one playlist; you can edit the content as often as you want. Also you can set it to send a mail to users when a new slide is available for them (yes, email is set as page/post too). 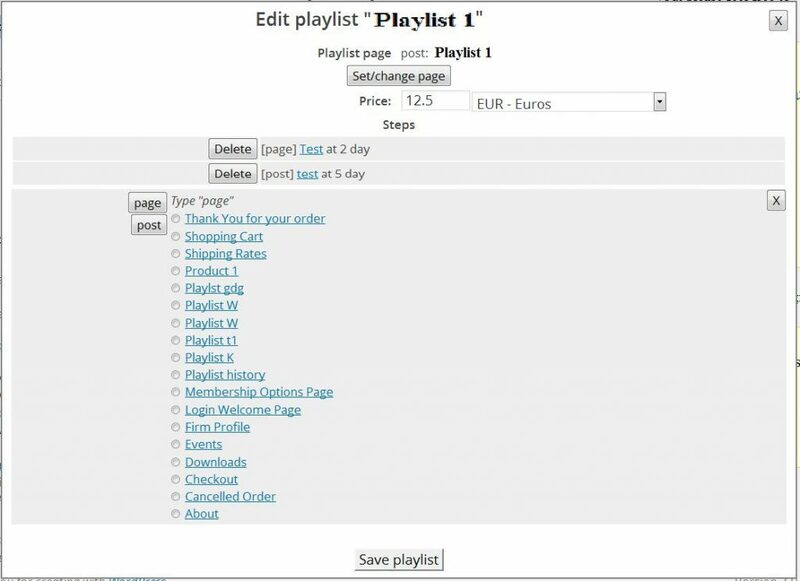 Also there is a shortcode to show all purchased playlists (yes, by user :-) ). Read more in section "Usage". Nothing special, just a generic installation from a ZIP file. Then you should go to admin page (Dashboard -> Settings -> KC s2M Drip Playlists) to create playlists. Examples: You sell different courses. In a slide you put a text like "This is your %%kcs2mdpl_playlist_name%% course". If member see that slide with a playlist named "Algebra", it will shows "This is your Algebra course". If member see it in "Botanic" course, it will be "This is your Botanic course". Also, if same text is in email's body, when email is send to remember about the new slide, it will have the correct text for the exactly course. Please think twice, as some of them are not "pure strings". The "%% tag" can be inside other "%% tag" or "" shortcodes. At all the involved pages/posts you must use "%" sign only with those tags, as using without tags will "froze" the script. After replacements, all the shortcodes (include s2Member® ones) will be replaced/executed too. You can see this info at admin page too. How much slides it will have [in my example - 3]? What will show each slide [1 - text, 2 - picture, 3 - video]? Will you use slides from other playlists [no]? How much members will pay for the playlist [15 USD]? When (at which day after payment) each slide will be accessible [1 - day1, 2 - day6, 3 - day15]? Will be a mail to the member, when new slide is accessible [yes]? Create one page or post, and hide it from general public. I would suggest a page - they are hidden by default. If you prefer to be post, it should be in a category, which is not shown. Why? Because each member will see different content, so not need to put it in blogroll. Well, if you want people to see it - that's OK, your choose. This is the "main page" of the playlist [I choose a page]. The content of this page/post must have the "%%kcs2mdpl_paypal_button%%" tag inside, at least once (or people can not pay...), with any other text (note the rules at point 1) people will see when they are NOT allowed to see the playlist. Most often people will see only the name [my name - "Playlist 1"]. So set a good name (rules at point 1 are NOT applicable to the name). Save and publish it. Important part is the content. Set the content to what you want to be seen at each slide [1 - text, 2 - picture, 3 - video]. Save and publish it. Remember, we create a "drip content playlist", so at day1 to day5 will be seen slide 1, at day6 to day14 - slides 1 and 2... and so on. If you need email to be send, create a post/page for it. Same rules as above, but the name will be the subject of the email, and text - the body. Subject and body can use the rules at point 1. Note that this email is for all the playlists, so think "globally". Now check all the new pages/plugins, check names, content etc. All these you can edit as often as you need. As for now they are [hidden] [pages]/plugins, not connected yet. Now we go in plugin's admin area. Please go to "Settings -> KC s2M Drip Playlists". If this is your first time in plugin's admin area, don't forget to set default currency, then click "Update options" before all other changes. In plugin's admin area we will assemble the playlist. At top of the page stay a list with existing playlists. If you have no lists, there will be just "Add new" button. Click it. Opens "Create new playlist" pop-up. Set the steps. There is "Add new step" button, opened a list with pages/posts. Just find your slides, put "days after payment" and click "Set" next to them. Don't worry about the order, plugin will fix it. Click "Save playlist" and you get a new row in the playlists table. If you need email to be sent, click the "Yes" radiobutton and set it. It's just like to set the playlist page. Click "Update options". Monday - Pay for access to playlist. This is day 0 or day 1? Tuesday - Day after payment. This is day 1 or day 2? A: Monday is day 0, Tuesday is day 1. All "day 1" slides are visible at "day 0" too. You can have only "this" version with One version license. Bug fixes and updates to the plugin will be free. Upgraded version will be made available for purchase when it is released. If you need to use this plugin on multiple sites, please, purchase the Developer license. You must log in or create account to purchase this plugin. This entry was posted in WordPress plugins, WP+s2M Content Drip, WP+s2M plugins. Bookmark the permalink.